Standing on the steps of the Shirley House, the only historic structure in Vicksburg National Military Park remaining from the Civil War, you can hear the wind in the trees and birds singing. Roses are in bloom, and their fragrance permeates the air. In 1863, this place would have smelled and sounded very different. The roar of cannon and screams of the wounded would have mixed with the acrid smell of gunpowder and sweat. Monuments throughout the park stand testament to those soldiers who fought and died on the very ground you now walk upon. 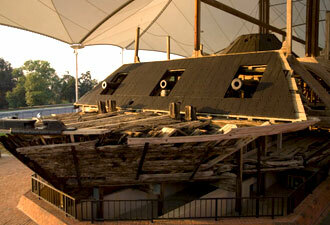 Vicksburg National Military Park is one of only five national military parks that have been preserved almost intact. Here you will find more than 1,350 monuments, making Vicksburg one of the most accurately documented Civil War sites in the nation. Incredible craftsmanship has gone into the creation of these memorials, with each having its own symbolism and story to tell. Step aboard the U.S.S. Cairo to get a feel for the life of a Union Navy sailor and the Mississippi River “Brown-Water” Navy. Inside the only Civil War ironclad gunboat still in existence, you can imagine the dangers of travelling through hostile country inside a 120-degree inferno. Visit the U.S.S. Cairo Museum to see the items the sailors left behind when the U.S.S. Cairo sank in the waters of the nearby Yazoo River. Mark Twain called Vicksburg National Cemetery the “most beautiful of all.” Here, you can explore the final resting place of people from all walks of life. More than 17,000 Union soldiers and sailors, 13,000 of them unknown, lie beneath towering magnolia trees overlooking the river for which they fought. Throughout the year the park demonstrates why “Vicksburg is the key” and “… the nail head that holds the South's two halves together”—sentiments expressed by both President Lincoln and President Davis, during the Civil War. Vicksburg National Military Park commemorates the service and sacrifice of Union and Confederate forces, enslaved peoples, and civilians. 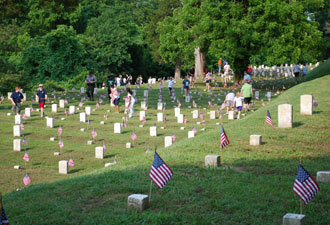 In 2013, the park hosted numerous sesquicentennial events, culminating with multiple events during Memorial Day Weekend. Volunteers are always welcome for projects that include the annual tradition of honoring America's fallen heroes by placing more than 18,000 U.S. flags before the gravestones at Vicksburg National Cemetery for the Memorial Day weekend. July 3rd, 2013, evening visitors will witness a large luminary display along the tour road and at each state memorial, a reminder of the casualties suffered during the conflict. On July 4th, the Stars and Stripes will be raised at the Old Court House in Vicksburg, commemorating the surrender of the city. 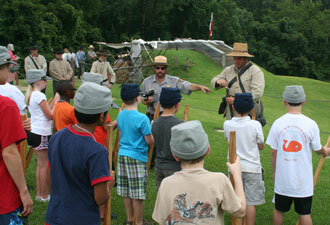 Visit during one of the many living history demonstrations that take place each summer. You can tour the park with a licensed battlefield tour guide, or visit on your own with an audio CD tour, cell phone tour or using the QR codes posted on wayside exhibits throughout the park. The park's Junior Ranger program invites youth to explore, and activities take place throughout the year for those young at heart. We encourage you to visit and experience your America!